This stunning Lakefront Retreat sits directly on your own, private lake shore. Located on the most beautiful south east shore of the 10 mile long Greenwood Lake, this home offers ALL the ways to enjoy lakefront living. In the summer, sip your morning coffee with your toes in the water, dine alfresco on the home's picturesque outdoor deck, spend the day lounging/fishing/sunbathing/swimming from your private 30 foot dock. In the winter, take in the magnificent seasonal sights, including bald eagles fishing on the water and families of swans wading through the lake in front of you. Memorable evenings can be spent soaking in the most stunning sunsets from almost any room in the house, or gather around your fire pit for smores or a nightcap. Spring/Summer/Fall: complimentary use of two kayaks (a tandem and a single) and two stand up paddle boards. From the dock, enjoy excellent fishing. Or take advantage of nearby powerboat rentals. Winter: A frozen lake welcomes ice fishing, snowshoeing and cross country skiing. Join in pickup games of ice hockey and ice skating. Enjoy tubing, skiing and snowboarding at nearby ski mountains (free lessons for kids!). Take a tour of the local craft breweries and Warwick Winery, or cozy up at many fantastic local restaurants with a hot cocoa or hot buttered rum. Local hiking trails are absolutely stunning in the winter months- only rivaled by the views right out your lakeside windows. This Lakefront Retreat is the perfect place to entertain or relax with family and friends. Designed for ease and comfort, this home is stocked with everything you will desire to make the most of your vacation. The oversized master bedroom features a king size bed, private second-story balcony, walk-in closet, floor to ceiling windows and breathtaking views. The second bedroom features two full size beds, a 44-inch flat screen TV and walk-in closet. Also located upstairs is the spacious full bath with walk-in shower, marble counter tops and double vanity. Downstairs boats a designer kitchen and island bar which seats five, complete with everything from margarita and martini glasses to chef-level appliances and utensils. Whether you decide to create in the kitchen or take advantage of the deck-side BBQ, it can all be enjoyed with stunning lake views. Relax and gather in the living room which also boasts stunning lake views, a 50-inch flat screen TV with DVD player and Apple TV, and a sofa which converts into a Queen size bed. This is a full season vacation retreat. The Fall offers breathtaking views of foliage changing colors along the lake and Hudson Valley. Enjoy local craft breweries, hiking, apple picking and pumpkin picking. In the Winter, enjoy nearby skiing, snowboarding. sledding, tubing, snowmobiling and ice fishing. Take advantage of the cozy indoor fireplace and parking in the garage and out of the snow. 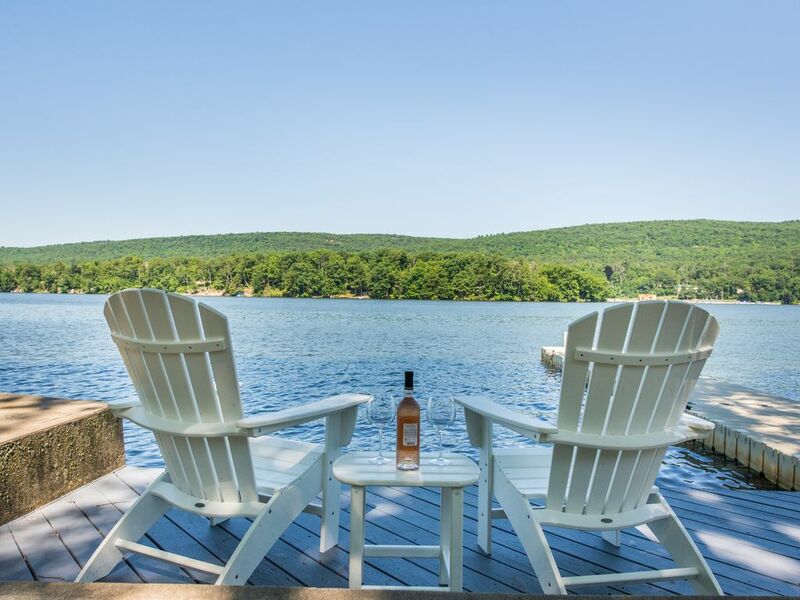 We look forward to welcoming you to your Luxury Lakefront Vacation Home! An absolute gem tucked away in a quaint location with amazing lake front views. This lovely house is just the appetizer with sunset skies over the lake as the main course. With the incredibly comfortable beds, the only thing pulling you out of them is the morning rays through beautiful windows overlooking the lake from the master suite. Every amenity is top notch and you’ll want for nothing during your lakefront getaway. We couldn’t recommend this Lakefront Oasis any more! A perfect spot for a family of 4 or a great location for a romantic retreat. We hope to come back for years to come! The house is gorgeous with a beautiful view, everything you need is there.. from kitchen needs to cleaning stuff, even some board games. Very recommended for a city or routine scape! Place was just as we expected. Very nice house with great location right on the lake. View from master bedroom facing the lake was amazing. Pleasantly surprised to find the snow and ice cleared from drive and walkways when we arrived. We would definitely like to stay again - perhaps when a little warmer so we could enjoy the lake more. The home and its location was perfect for a quiet get away. The home is beautiful, super clean and had everything you could need. The lake was frozen and it was so beautiful and peaceful. We enjoyed all the amenities of the home from the outside fire pit, the gourmet kitchen to the board games. The location was perfect, only just over an hour from the city yet feels like many hours away. The night sky was full of stars. Wonderful state parks around for hiking. It was a perfect vacation for us. Thank you so much and we can't wait to come back. Just loved it!! Perfectly equipped and property management accomidating and responsive. Gorgeous house. Absolutely lovely, tranquil and serene just what we were looking for, can’t wait to come back. Our stay was perfect, the house was as expected and our overall experience was Fantastic.